So I got sucked into the hype over beauty boxes and signed up to one, that one being GlossyBox. 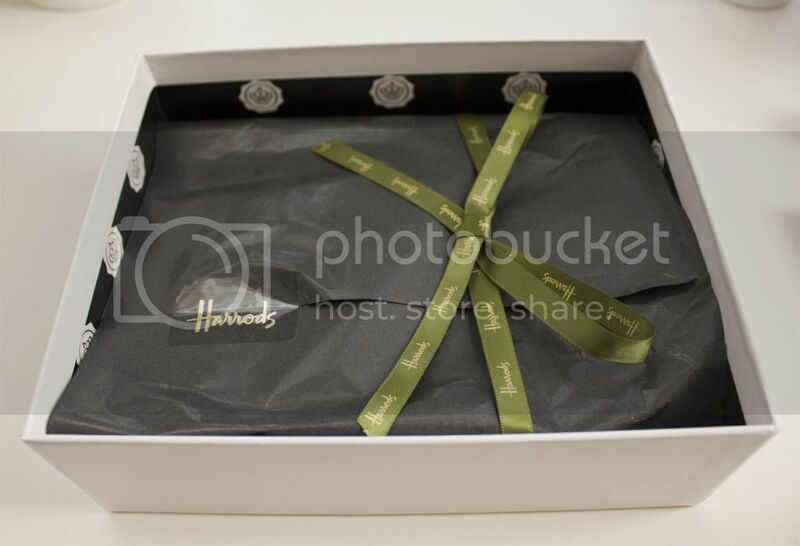 After seeing all the excitement over the Harrods box on Twitter I decided to take the plunge and just order one and see if I liked it. Ive been thinking about it for a few weeks after seeing them all over blogs but didn’t know whether it was a waste of money, but then the Harrods special swayed me. I was excited by the idea of getting high end samples. I particularly wanted the little Burberry lipstick but sadly I didn’t get one :(. The products I got were; the Versace Vanitas eau de parfum, the Bliss Blood Orange and White Pepper Body Butter, the Revive Intensite Creme Lustre, the Lancome juicy tubes toffee R’N’B 93 and the Clarins Extra Firming Body Cream. This isn’t much of a review because to be honest I haven’t tried all the products yet. 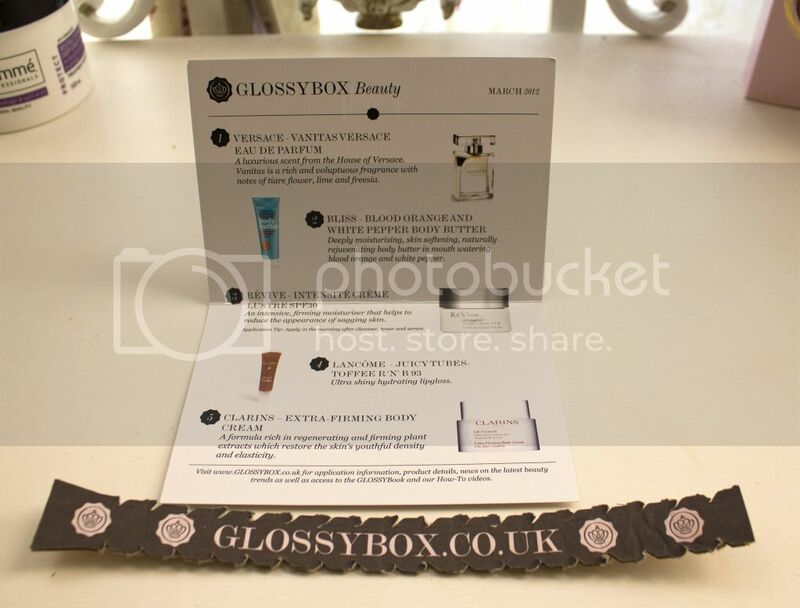 Its just a post to say wooo I got my first GlossyBox really haha. Lancome Juicy Tubes Toffee R’N’B 93: Im not really a big fan of the ‘sticky lips’ look that this gives. It does smell amazing though, I’d rather eat it! It didn’t add any colour to my lips, it just made them look really sticky, I had to have it on for a while so that it wore off a bit before I was happy with the look of it. Clarins Extra Firming Body Cream: I haven’t gotten round to using this yet sadly, I definitely will soon because it sounds really good, all that firming and smoothing shizz! Revive Intensite Creme Lustre: I haven’t used this product, purely because on the explanation it said something like ‘for sagging skin’. Im sorry but this does not make me want to use it, its not the nicest of ways to describe peoples skin. So I left that one. I was considering giving it to my mum but she probably wouldn’t use it. I guess I will use it in the future I just didn’t like the way it was worded on the description, such a lame reason I know haha. I’d just rather it feel and sound luxury rather than gross and depressing!